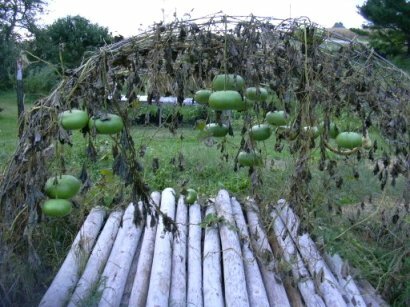 Here is this year’s gourds drying down own the vine. We’ve found that the best way to dry the gourds is to leave them outside over the winter. We’ve tried bringing them in the barn or house, but they just seem to rot. So outside they will hang. See the August 26th entry for the gourds in full spendor. We’re working on making the gourds into useful items – the obvious one is bowls (maybe we’ll get beyond that this year!). 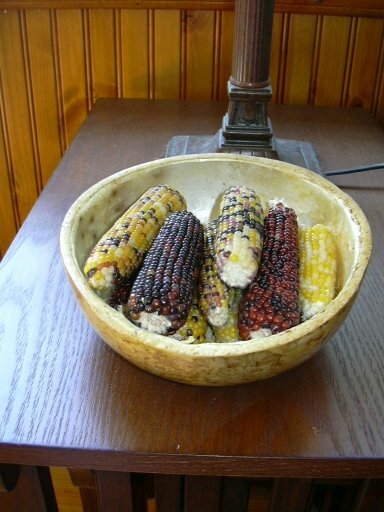 Here’s a seasonal display using the miniature corn and gourd bowl. Had our first light frost – nipped some tips of tomatoes and some scattered frost on grass but didn’t kill much. Oh well – I was hoping for an end to it all! 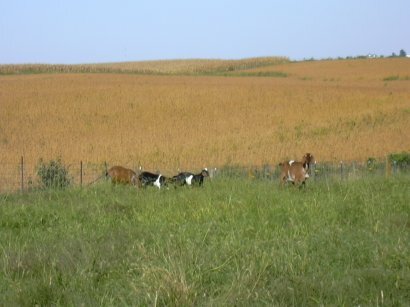 Here’s a fall picture of the goats on a very green late September pasture. I’m almost through with “The World is Flat,” by economist Thomas Friedman. I’ve had people from many disparate jobs and occupations recommend the book, I had to read it. The book looks at the breakneck speed of global economics and the threats and opportunities to worldwide and American ways of life. Although it is hard to distill the book in a short space, one of the most intriguing dealt with science and technical education, a national mission, and energy. Here’s a link to a very short, but good synopsis of this part of the book. Even though it was a town work day, farming work was done today. 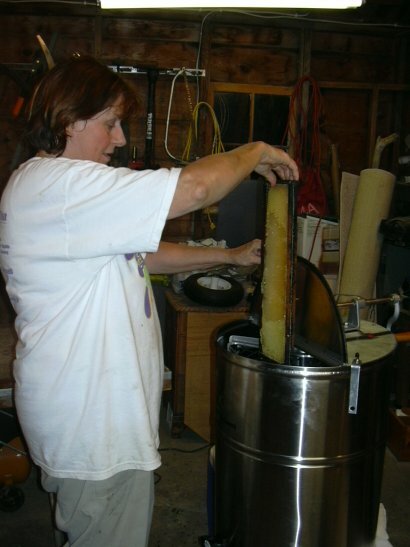 Today, Joanne extracted the honey from the first-year hives. 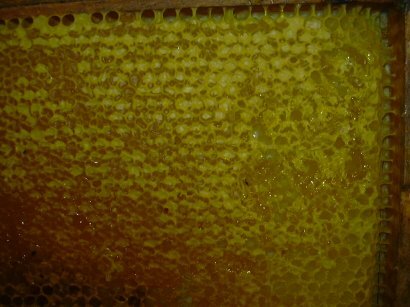 Here’s a section of a frame of honey still in the comb. The frames go in the extractor. 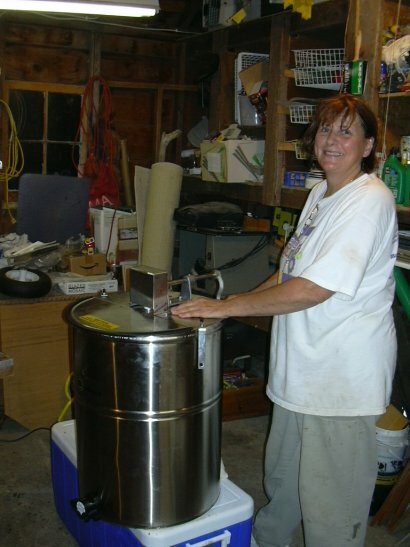 The extractor gets spun around manually to spin the honey out – think a giant salad spinner or a very slow autoclave for the scientists out there. 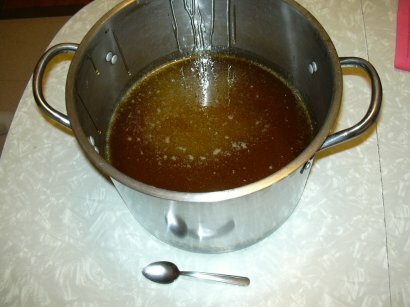 Finally, the pot of honey – kind of like making something from nothing – like fruits from sunlight. There’s a million things (ok maybe that’s a slight exaggeration)that are on the list. Many of them are not difficult – it’s just that only one can happen at a time. The last few days, I’ve been working on one of those “I’ll get to it someday” projects – making some more shelving in the machine shed. This section of wall was particularly unkept – so I bought some shelving frames and scrounged the shelves from leftover wood and wood salvaged from torn-down buildings. The result is 14 or so feet of five levels of storage. 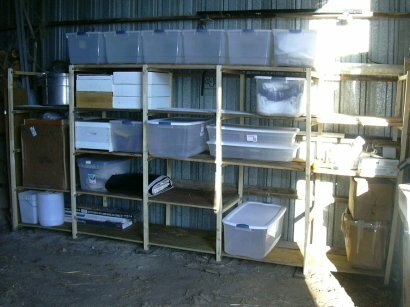 It is especially useful for all the additional beekeeping equipment joining us this year. I’m especially proud of this rotation we’ve put together this year. First was potatoes and onions. After onions and potatoes were pulled, we planted buckwheat, which acted as a cover crop and great flowers for the bees. 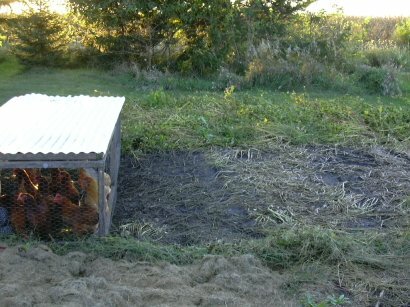 Now we are running chicken tractors over the buckwheat – the chickens are eating all the seeds and leaves and leaving next year’s fertilizer! To the right, you can see the garden the chickens have cleaned up and towards the top, the buckwheat waiting to be eaten. The chickens are eating virtually none of their usual food, preferring the buckwheat. Just as things were getting dry and I was about ready to water this year’s trees, the skies opened up with about 1.5 inches of rain this weekend. This morning was the last farmer’s market for this season. I’m at the point where I am looking forward to the first frost to kill all the living plants in the garden. I’m through, for now, canning and freezing and ready to start eating! After market we picked up some of the girls’ friends and drove to Ames to go ice skating and to Hickory Park for birthday dinner. The camera would have been great to have on the rink! That evening, we went over to neighbors where the kids had a blast making diaramas of sorts on linoleum squares, various figurines and glue guns. I even bought one from Martin for a dollar. September 23, 2005 – Childhood Heroes! 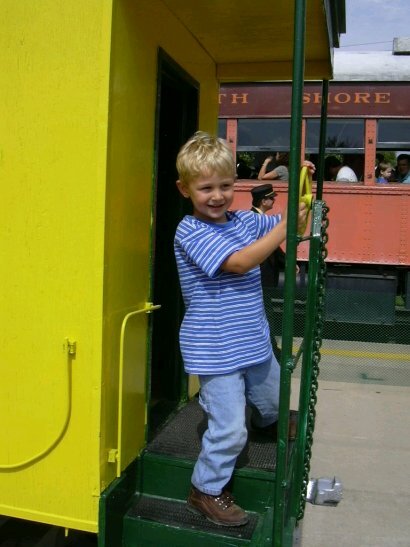 Today Martin and Grandma Jo journeyed to Boone to see Thomas the Tank Engine live in person! It was a very big day for Martin and a highly anticipated day. 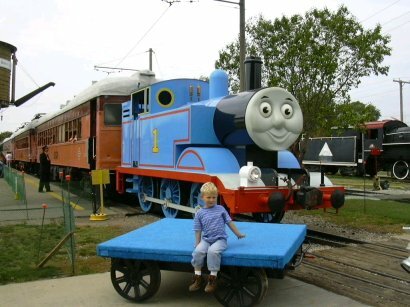 Martin gets to see Thomas close up but notices he doesn’t talk to him. The steering wheel is really on the caboose and Martin is really steering the train. 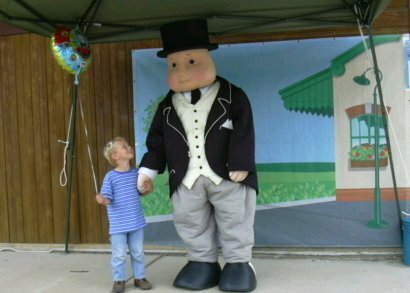 Martin meets up with Sir Toppem Hatt. This Friday and Saturday there will be footage from our farm on “Market to Market” on Iowa Public Television Friday at 8:00 p.m. and Sunday at 12:30. The last few days the first bean harvesting has begun in adjacent fields. 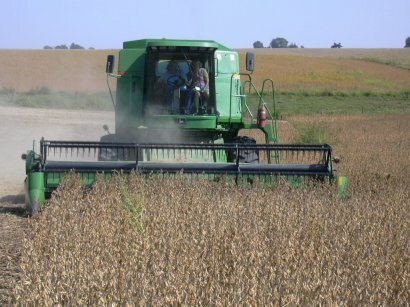 Here’s our neighbor testing out the combine in the field adjacent to our place. After the field was harvested, Marty wanted to go look. So we found some stray soybeans and gathered them up to show everybody. Then he just ran and ran in the field, for a long ways – like he was reveling in the open spaces just created. It was gratifying to have such a big playground and sense of freedom and security to run so far. I liked looking at his figure – small, strong, and sure – running in the distance. September 19, 2005 – Cover Girls! 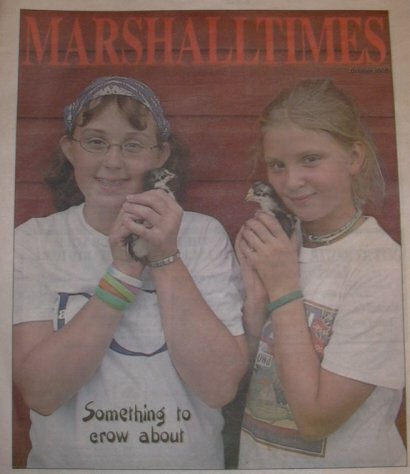 Here’s the cover of the insert section of Sunday’s Marshalltown paper. Don’t those chicks look cute! 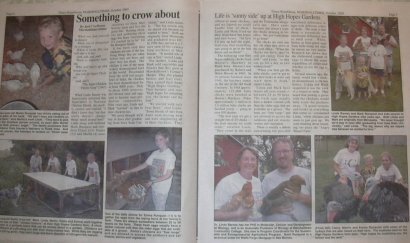 The writer found us via our web site/blog and wanted a local story about chickens. He came out, took a few pictures and talked to us a while and did a good job on the reporting. There are lots of color pictures in the story as well. As if this wasn’t enough, the front page of the paper had another article about the Sustainable and Entrepreneurial program at MCC. 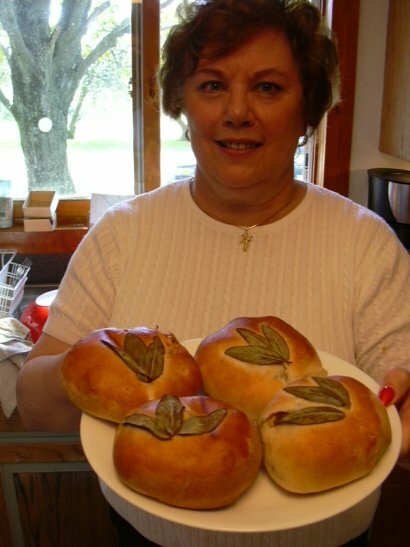 We had a great time testing out some new recipes from Nana this weekend. 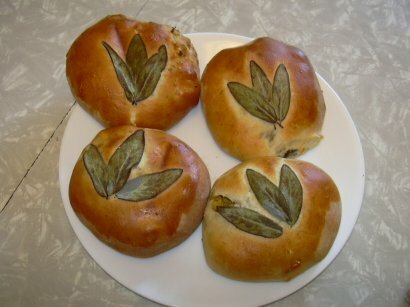 Here are some stuffed chicken loaves with sage leaves fresh from the garden. Claire and Emma have birthdays just one day apart this Friday and Saturday. Claire lifts her birthday present aloft – tickets to her first big concert – Paul McCartney in October. She also was not allowed to have pierced ears until she was a teen, so that was the first thing she did on her birthday. 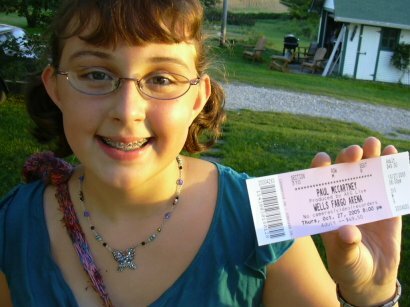 Emma also got a concert ticket and more durable headphones. 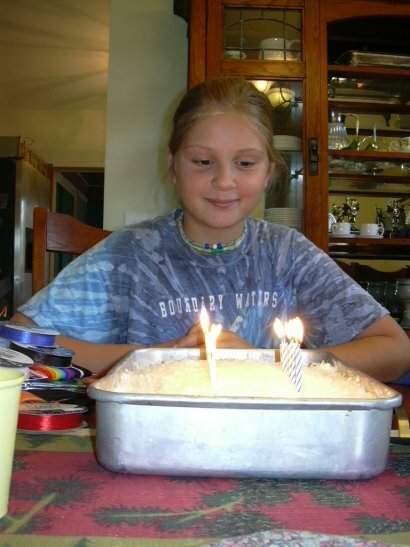 Here’s Emma before her birthday cake! Since I've become a more irregular poster, you have the option to enter an email address to subscribe to this blog and receive notifications of new posts by email. There are two spiritual dangers in not owning a farm - one is the danger of supposing breakfast comes from the grocery, and the other that heat comes from the furnace.